Untrained volunteers may have set back frantic efforts to pump out water from the Tham Luang cave in Thailand's Chiang Rai province, as experts race to free 12 boys and their football coach from a two-week ordeal underground. An army of volunteers descended on the site after the plight of the boys, aged 11 to 16, gripped the nation. But authorities revealed that unauthorised actions had obstructed the official operation. 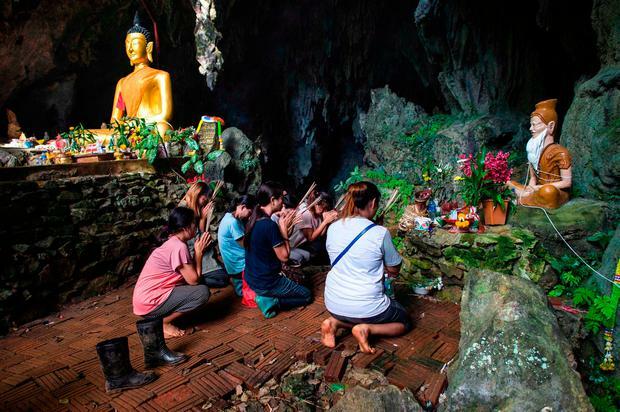 Some unregistered volunteers had started pumping water back into the ground and it had returned to the cave, Chiang Rai's governor said. "They [believe] their technique is effective, but anything not in the plan must be discussed with us first," he added. The rapid draining of the cave complex is the crux of the rescue plan. Navy Seals spent yesterday training the boys to use scuba gear in the event that they may be forced into an emergency dive through submerged tunnels if approaching monsoon rains cause floodwaters to rise to dangerous levels. The boys are being fed with high-protein drinks to regain their strength after being deprived of food for nine days. However, a medical assessment yesterday concluded that it was still too dangerous to move the weakened group. It said that two boys and Ekkapol Chantawong, 25, their coach, were suffering from malnutrition and exhaustion, reported CNN. Mr Chantawong is said to be in the worst condition after giving the boys all of the water and snacks, without nourishing himself. Rescuers hope to be able to drain enough water to enable the boys to walk, swim or be floated out. High-pressure pumps have been installed and holes are being drilled in the walls to make way for hoses that will help to drain the chambers. Irrigation channels and reservoirs have been created outside to divert rainwater. The authorities reported some success, with a 40pc fall in water levels, and a continuing drop of about 1.5cm an hour. Roughly one mile of the cave network is now walkable, leaving a further 1.5 miles to be cleared. However, one firefighter said key parts of a passage out are still totally underwater. It currently takes experienced divers six hours to reach them. Fears are growing that gains could be reversed by heavy downpours forecast for the weekend. A rise in waters could leave the boys stranded for weeks or even months. "What we worry [about] most is the weather," Narongsak Osatanakorn, governor of Chiang Rai province, said. "We can't risk having the flood back into the cave." Mr Osatanakorn asked Thai navy Seals in charge of extraction plans to estimate what sort of a risk would be involved to take them out and "what kind of readiness we can have today and decide if we can take that chance". He said earlier that not all 13 may be extracted at the same time, depending on their condition, adding the boys have been practising wearing diving masks and breathing, but he does not believe they have attempted any practice dives. 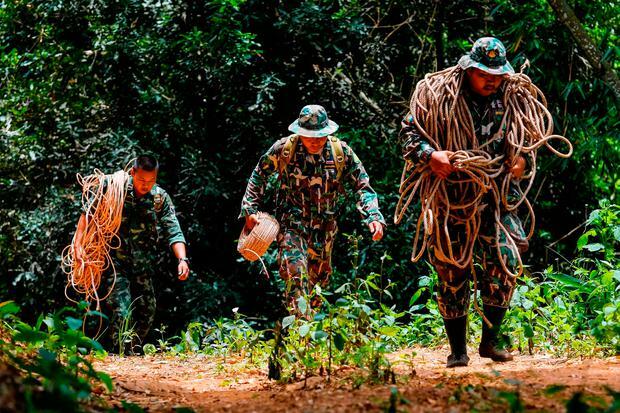 A 1,000-strong team is working around the clock on different solutions and 20 to 30 teams are scouring dense jungle above to find possible shafts. The boys and their coach disappeared after they went exploring in the Tham Luang Nang Non cave in the northern province after a football game on June 23. "Experienced divers are wary of taking out the boys through the dark and dangerous waters, especially since they are untrained. We are talking kilometres of transport under the water with zero visibility," said Claus Rasmusen, a certified cave diving instructor based in Thailand who has been helping the Seal team with logistics. "It's difficult." Thai cave rescue: How can the boys be rescued and what are the risks?